season and of course, we end up picking more apples than we could ever eat. One of the ways we can use apples in the kitchen is by incorporating them in either sweet or savory dishes. Since we focus on breakfast here, we will be trying out a few new apples recipes. 9-by-13-inch baking pan and bake at 350 degrees for 1 hour. Some folks prefer a cool glass of apple juice (the hard stuff) over baking! If that is you, we recommend visiting a Halcyon Days Cider Company for some fine apple sipping. Halcyon Days Cider Company is a hands-on, family owned and operated small farm and cindery only twenty-one miles from Fox Hill. The family has planted more than 50 varieties in their labyrinth, which consists of about 2,000 dwarf apple trees. Through an 11-circuit path, you are able to wind your way through the modern American, heirloom American, classic European, and Central Asian ancestral apple trees to a pavilion with epic 360-degree views of the Alleghany and Blue Ridge Mountain ranges. The apples are combined in several ways to create sweet and sharp flavors – one of the blends has a taste similar to that of sipping a glass of bourbon. Others flavors are sweet and easy to drink. Monday. After Labor Day weekend, they will be open 11 a.m. to 6 p.m.
and beautiful fall colors await you at Fox Hill Bed and Breakfast. 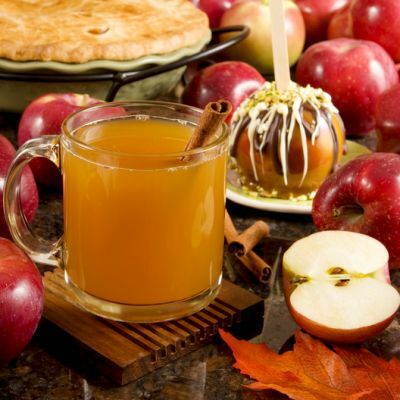 Plan a stay and enjoy apples, cider, and adventure!